$395 [Includes $95 lab fee] Class limit 16. Oct 4-6 (Fri-Sun) 10am-4pm. Working with indigo is a journey that connects us to people, places, and cultures. Each indigo vat has its own personality, and each comes with its own traditions, history, and stories. This workshop will take students through a number of recipes for creating a healthy working indigo vat—including the thiourea, ferrous, fruit, and henna vats. Students will explore the benefits of each vat and learn how to choose the right recipe for a particular project or environment. Indigo is a versatile dye that lends itself perfectly to shaped resist, clamp resist, and numerous other traditional techniques used for millennia all around the world. 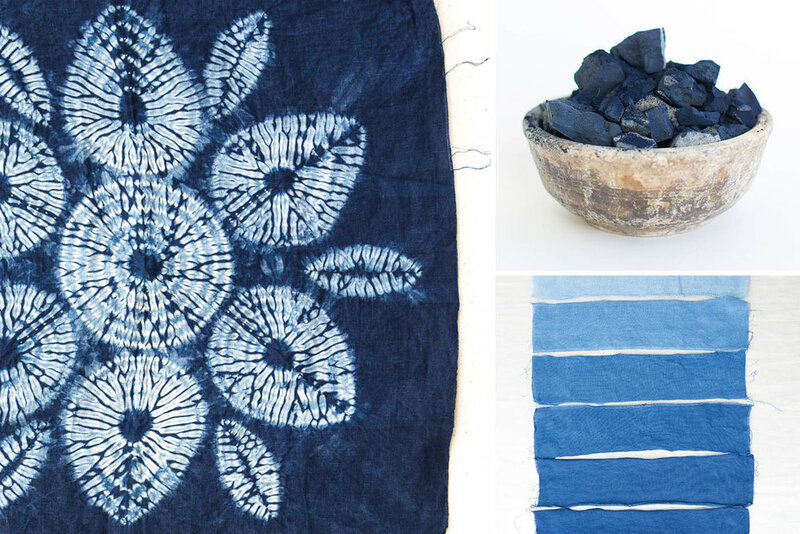 In this three-day workshop, students will work hands-on, manipulating cotton and silk and linen fabric to discover all the depth of shade possible with natural indigo. Since 2011 Danielle has developed and taught workshops for the Maiwa Textile Symposium. In 2009 Danielle represented Maiwa at the International Shibori Conference held in France, and in 2011 she was a facilitator for the Maiwa Natural Dye Master Class taught by Michel Garcia in Bengal, India. Danielle has a deep understanding of and aptitude for dye techniques and the creative process. Together with Sophena Kwon, Danielle travels to India each year where she helps manage the Maiwa studio. Sophena grew up with Maiwa as the family business. She has learned much from the artisans Maiwa collaborates with (including master dyers in India, Africa, Peru, and Mexico) and from experimenting alongside her mom, Charllotte. In 2009 Sophena studied with Michel Garcia in France. She has taught natural dye workshops with Charllotte (including at the Penland School of Craft and at Shakerag) since 2012 and developed and taught workshops for the Maiwa School of Textiles since 2014. In an effort to bring natural dyeing to a new audience, she founded the immensely successful Indigo Social in 2015. In 2016 Sophena was invited to present at the Mood Indigo Exhibition at the Seattle Art Museum. In addition to her natural dye work, Sophena is a skilled photographer and clothing designer. Each year she travels to India to direct the Maiwa line of clothing.